I’ve been thinking a lot lately about how I desperately craved time to myself when my kids were little. Don’t get me wrong, I loved my kids at every age, but I also wasn’t very good about creating “me time” (or the more politically-correct term, “self-care”), and I would often feel overwhelmed by the sheer hours and emotional drain of being a caretaker for another human. All. The. Time. The baby days seem like forever ago. Snuggling my nose into soft tender skin and sniffing delicious baby smells has somehow turned into the stomach-turning stench of adolescence that wafts like a toxic cloud of despair. Children that used to clamor for space on my lap now roll their eyes so violently I worry they will suffer brain trauma. Walking through my house was once a dance-like affair, picking space on the floor in between my small humans as they lay prone amidst the ride-on trucks, Polly Pocket Princess People, and (cute toddler-sized) socks. Now I wonder where my (not-so-small) humans might be hiding as I walk through my house, finding random chargers, plugs, and (smelly, gross) adult-sized socks. My kids are no longer clamoring for my attention. In fact, they mostly find me annoying and try to avoid me as much as possible. My 15-year-old, when I mentioned this to him, said it’s because I’m always asking them to do something. Homework. Chores. Shower. Brush Your Teeth. You can tell I’m a real drill sergeant. I like to think my rules make sense. You do need to brush your teeth every day, and yes before you go to school. Somehow yellow plaque-filled teeth don’t seem conducive to learning. My role is to harass you until that is done. You do need to do your homework and give your best effort for every test. The only way I can contribute for help with that math class is to sit next to you and pat your hand and cheer you on – the math gene skipped a generation for me. No wonder you’d rather be alone in your room when I’m that much help. And yes, you must do your required community service hours. As a bleeding heart, I love that so many schools have made community service a required part of graduation. But here is where I get to insert myself and be part of the game. Because I, too, can volunteer right next to you. And that makes you have to spend time with me, whether you like it or not. There are literally thousands of places one can volunteer in our country. You can even search online to find something that suits you, with national sites like VolunteerMatch.org. Pick your location, your passion, your availability. Boom. How lucky I am that we found a spot just 40 minutes from our house that hit all the right marks for us and the world. 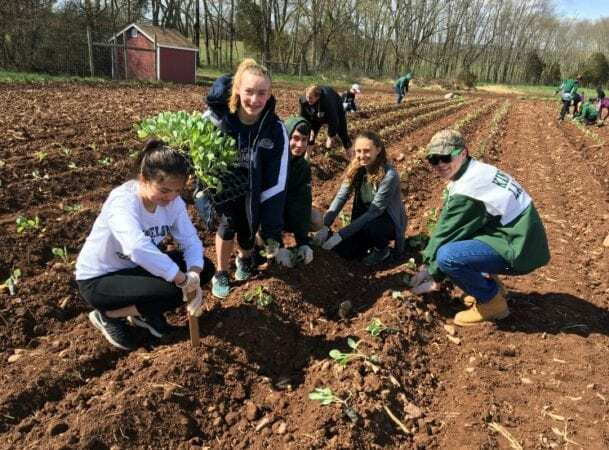 America’s Grow A Row, based in Pittstown, New Jersey, is a 327-acre farm that feeds the hungry, which sadly numbers over one million people in my home state. 13% of the population of New Jersey is food insecure. Food insecurity, food deserts, the working poor, are all part of the educational talk these amazing nonprofit leaders, farmers and educators – standing side by side in their muddy boots – share at the beginning of a work shift. The rest of the morning my 15- year-old and I were harvesting corn and apples, which would be sent directly to food pantries for those in need. Typical food drives focus on shelf-stable items, which makes sense as it travels from home to schools and churches to the food bank. But supplying fresh produce – nutrient dense fruits and vegetables – is a relatively new effort. What might have been a one-time donation quickly turned his attention to an immediate need in his community. “Please come back next week,” a woman asked him, stopping him on his way out the door. “My doctor tells me to include fresh vegetables in my diet for my health, but I can’t afford them.” Chip returned with more produce. And increased his garden size. In 2008 he left his corporate job and started farming full-time – with every pound of produce going to the hungry. My son heard all of this education with me, and we crossed over the street into a new 40-acre field. Chip’s been expanding the farm a bit each year, buying up acreage and planting more and more. We were part of a group of about 50 volunteers, of every size, shape, age and shade under the sun. Harvesting corn was immensely satisfying, and I started to wonder about my former life as a farmhand as I pulled off an ear of corn (twist, snap down towards the grown, remove giant leaf that seemed to want to go along for the ride. I nicknamed the long random piece of husk the Momma leaf – hanging on and being annoying and not quite wanting to let go). We stomped down the remaining stalks into the ground, which indicated the stalk was done. Sometimes a stalk of corn has a baby corn along with it, but mostly one stalk equals one ear of corn. We tucked the ears into a huge burlap sack, and I did my best to remember not to let it get too heavy, as we would need to carry it over to empty the sacks into huge boxes on pallets in the field. Apparently we were such a quick work group that we finished the acres of corn way faster than expected, and we all walked up to the apple orchard to harvest apples next. More giant boxes and pallets, and a swarm of volunteers stripping apple trees bare of their fruit, being careful to keep from damaging the trees. I remembered bringing my son to a you-pick apple orchard for the first time when he was two years old, snapping pictures as he toddled, stumbling over fallen apples and swatting away bees drawn to the scent of decaying fruit. I remember thinking then what a waste it was to have so many apples on the ground. Here we were, more than a decade later, and we were on our hands and knees, “gleaning” what fruit was still in good shape, to offer it to someone without. “Gleaning” is a term from old- testament biblical times when the poor got the leftovers. Now it’s also about preventing food waste. In the United States, 31%, or 133 billion pounds of our food supply goes to waste here in America each year. There is no reason for anyone to go hungry. We just need to do a better job of getting the food to those who need it. On a random Saturday this fall, I “made” my teenager get up early. I “made” him listen to a talk about people who are hungry living near us. I “made” him work in a cornfield and an apple orchard. Our volunteer group harvested over 24,000 POUNDS of fresh produce. My son and I were dirty, muddy, tired, sweaty and stinky, and together for a few hours. He fell asleep in the car on the way home, dozing in the sunshine. I looked up at his face from my driver’s seat and thought about how I probably would have had a hard time convincing him to go to a you-pick apple orchard, or pumpkin farm, or hayride and corn maze like we used to do in the fall as a family. But this experience? The “you have to do volunteer hours and I’m coming with you”? There wasn’t a lot of pushback. This made sense to him. He was needed. Helping others and sharing time together? Colleen Markley is a freelance writer living in Chatham, NJ. Colleen writes a blog about things that happen in life entitled www.YesItReallyHappened.com, a comedic and thoughtful look at life around us. In addition to presenting stories that are funny, relevant and connective, she also volunteers with numerous organizations in our community that are dedicated to making the world a better place. A graduate of Boston University, Colleen studied screenwriting for film and television, finished her first novel last year and is working on her second. She is the recipient of the Boston University Screenwriting Achievement Award, as well as the “Blue Chip Award,” the most prestigious honor offered by the College of Communication. Colleen previously worked at Thirteen/WNET, the public television station in New York City.